5 Practical Takeaways from Our Bali Retreat on Building Your Do-Good Business | Yellow Co.
After a few years of running large annual conferences and experiencing the power of women coming together in person, we knew there was another in person experience that would provide something deeper and more tangible we could offer our community of world-changing women. A large conference is awesome – don’t get me wrong, I love them! They’re inspiring and leave you ready to change the world (we’re BIG fans), but an intimate gathering with 10-15 women coming together under a specific topic brings a certain type of magic that a large conference can’t provide. This is why we’re so excited to be bringing you six unique, intimate, and practical retreats throughout 2019. For our first retreat of the year, we decided to go big. BALI! Why not go international for your first retreat?? Heck, why not schedule it for a time when you’re going to be 31 weeks pregnant?? Sounded like a good idea to us! In all fairness when we were planning this retreat and set the dates I was not pregnant and had no idea I would be :). But throwing an international retreat for our first time actually turned out to be amazing. In addition to adventuring through Bali, eating delicious food, visiting an all-natural, sustainable dye factory called Tarum Dye Factory, and mentoring teenage future entrepreneurs at an organization called Stella’s Child, we scooped up Jessie Simonson, CEO of social enterprise 31 Bits to spend a week jumping into the coaching, tools, knowledge, resources, and community needed to start, build, or scale our attendee’s do-good businesses. All while building new friendships with like-minded women and adventuring through the beautiful island of Bali. Our Bali Retreat was created for women who currently have a working product, program, or service that is helping people, and who are wanting to turn their side hustle into a full-time gig. They say that teaching is the best way to learn, and although I was a coach alongside the talented Jessie Simonson, there were so many things that I personally learned and was reminded of when it comes to growing and scaling a do-good business! I want to share with you five of the key takeaways from the content we studied and presented at the retreat. One of the most powerful workshops we went through at the retreat was modeled after Simon Sinek’s Golden Circle. It’s structured around having your WHY at the center of everything you do, then your HOW, then your WHAT. A lot of times we start with the WHAT, instead of diving into to core of WHY we’re doing what we’re doing. Your why is your brand’s purpose. It’s why you exist. The best brands and organizations know their why and filter everything through that. Like Simon Sinek says, “People don’t buy what you do, they buy WHY you do it.” Identifying WHY you do what you do is essential to making decisions as you move forward and allows you to engage your audience in a way that is meaningful and relatable. Although it’s not the most “urgent” thing to do when you’re running your business, taking time to articulate and figure out your WHY will save you hours of time and money in the future! If you don’t know your WHY, check out Simon’s Golden circle and take some time to brainstorm and articulate it. Know and practice your sales funnel. A sales funnel is, simply put, how you organize and categorize your customers and potential customers. It’s coming up with an intentional marketing plan to make sure those potential customers are interacting with your brand and moving down the funnel towards becoming actual customers. Then, towards becoming loyal customers who turn into ambassadors for your brand. Essentially, it’s how you make money and grow an amazing community of customers who will return to you again and again! At our retreat we found that this was a super helpful and important exercise when it comes to figuring out how your business is going to make money and bring in leads! Want to create your own sales funnel? Hop on our email list to download our Sales Funnel worksheet! A great way for small businesses to grow and make money is to collaborate and partner with larger businesses or audiences. Have you ever wondered how small businesses get started, begin making money, and really get off the ground? Quite often it happens when a small business partners with a larger business who has a budget and a larger audience. If you’re a product-based business, consider partnering with larger organizations for corporate gifting. Do you have a service that employees in larger businesses might benefit from? Modern businesses are always looking for a way to bring value to their employees. Get creative and consider how you can pitch what you do to larger companies. That way, you can make some good money and begin to create a deeper impact with your business! The best learning happens in person (and a beautiful setting doesn’t hurt!). There’s only so much you can learn from Google searches and online tutorials. Don’t get me wrong, there are so many great online resources when it comes to growing your business, but the GOLD comes from being in a room with other women, talking, collaborating, asking questions, getting messy, and helping each other. There’s nothing like it! So much more can be gained in an environment like this, not to mention the relationships that continue to support you long after the experience is over. That’s why at Yellow Co. we feel so passionately about creating heartfelt, in-person experiences for women, whether it’s at a retreat, a conference, or a Hive gathering. If you have the opportunity, get out from behind the screen and learn with women in person - it’s GOLD I tell you! Businesses are built by taking one step at a time. After going over seven days of content and workshops together, it was easy to feel overwhelmed by information overload! One thing we had to all remind each other of is that big things are accomplished one step at a time. It can get discouraging when you feel like you have so much to do and so far to go, but when we break down the big goals into smaller, more actionable goals and little to-dos, the big picture completes itself. So, when you get stressed with how far you feel from your end goal, remember, take it ONE STEP AT A TIME. Just start by taking one small step forward! We had such a great time at our Bali Retreat, and are excited to announce two more in-person experiences we’re hosting in June! We’re hosting our first ever Weekend Workshop to dive into a mini version of the content we went over in Bali, all aimed to help you grow and scale your do-good business. Join us alongside the Founder & CEO of P.F. Candle Co., Kristen Pumphrey at FLDWRK Fullerton as we workshop how to build your do-good business. Our next retreat experience is coming up June 27th - 30th in Portland! 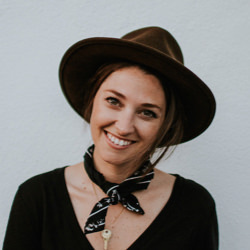 Join us as we dive into the Enneagram and dreamscaping for your life with Enneagram expert and CTC Certified Coach, Ashlee Sikorski. We will be spending a long weekend jumping into the coaching, tools, knowledge, resources, and community you need to better know yourself, your dreams, and ultimately your life trajectory.